Are You Building Leaders Who Can Make It Rain? 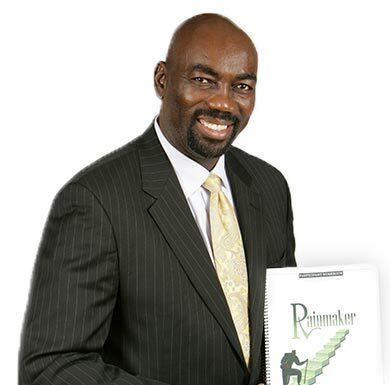 Rainmakers are the high achievers, the business developers, the moneymakers in your organization. Anyone can be a rainmaker: the owner and executives who provide strong leadership, the sales team that brings in revenue, the employees who build client connections. A rainmaker is anyone who takes an active role is growing a thriving business. Gain dynamite strategies for sales and leadership development in Ed Robinson’s high-impact keynotes and seminars. Grow your business now and build for the future with consulting that’s tailored to your unique goals and challenges. Uncover the secrets of powerful rainmaking with Ed’s books, video training, audio training and more! Asking the right sales questions helps you understand buyer needs and build profitable relationships that benefit you both. This is the key to rainmaking. In his Rainmaker Selling Guide, Ed gives you specific, powerfully effective questions for building these connections. Ask them at your next meeting and get ready to make it rain! Download a copy now for you and everyone on your team. Your privacy is important to us. We promise we won't share your email.